FRANCES DENSMORE freely acknowledged that the true pioneer in studying Indian music was a New England woman named Alice Fletcher. In one regard, their stories are remarkably similar: Densmore and Fletcher both embarked on their anthropological work as middle-aged, amateur scientists. Densmore collected far more actual songs. Fletcher's career met with much greater public and professional recognition. A generation older than Densmore, Alice Fletcher was both a pioneering ethnomusicologist and an active leader in the movement to incorporate Native American Indians into mainstream white culture. Born into a well-to-do New England family in 1838, Fletcher generally concealed the details of her early life. She attended the "best schools" and, as a young woman, taught for awhile. Fletcher was also active in upper-class feminist and suffrage groups in New York. It wasn't until she was in her 40's that Fletcher turned her attention to anthropology. 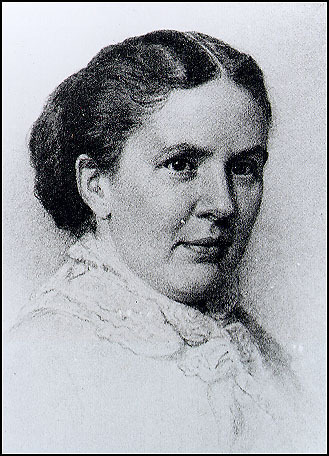 In 1880, she arranged to study informally under Fredrick Putnam, Director of the Peabody Museum of Archaeology and Ethnology in Cambridge, Massachusetts. Her intellectual exposure to the emerging field of American anthropology led to an interest in documenting Native American cultures first-hand. In 1881, Fletcher ventured into the field for the first time, studying and living with Omaha Indians of Nebraska. Fletcher was fascinated by Omaha culture - particularly their music and dances - and had close relationships with tribal familiar. She would ultimately adopt one member, Francis La Flesche, as her own son and life-long companion. Her time spent with the Omaha also proved to be her initiation into Federal Indian policy-making. Fletcher became an early and influential proponent for allotment, the government-sponsored movement to break apart collectively held tribal lands into individual holdings. Fletcher and other supporters of allotment believed that tribal collectives left the land ill-suited for development. They argued that until the land was individually parceled, whites would never respect Native claims. In 1882, Fletcher began work for the Bureau of Indian Affairs conducting surveys of Indian lands for eventual allotment. Fletcher's involvement with the BIA did not, however, result in the abandonment of her anthropological research. Fletcher was devoted to both causes. Indeed, her allotment work for the BIA gave her the financial means to continue with her intellectual pursuits, while her Indian studies helped her make policy decisions. After 1890 - thanks to a wealthy benefactor who would later sponsor Frances Densmore's first field trip - Fletcher won a position at the Peabody Museum and devoted her energies exclusively to anthropology. The result was a steady stream of publications. Fletcher often wrote in collaboration with Francis La Flesche, who also became a noted anthropologist. Together they would produce general studies of Omaha culture, a close study of a Pawnee ceremony, and numerous collections of Indian songs and music. In addition, Fletcher was aided by Jane Gay, a childhood friend who would become her constant companion and professional assistant, beginning with fieldwork among the Nez Pierce in 1889. Over the years, Fletcher became a prominent figure in anthropology. She is credited with bringing a scientific rigor to ethnological fieldwork in the emerging early years of the discipline. She served as vice-president of the American Association for the Advancement of Science, was a founding member of the American Anthropological Association, and headed the American Folklore Association. Fletcher died in 1923. She and Frances Densmore never appear to have been close friends, but Densmore often dined at Fletcher's Washington home when visiting the capital. Like Frances Densmore, Fletcher left behind a vast legacy of professional writings, but destroyed most of her personal papers. NOTE: The most comprehensive work on Alice Fletcher's life is Joan Mark's biography A Stranger in Her Native Land (Lincoln, NE: University of Nebraska Press, 1988).